I am a massive fan of Tess's Rizzoli & Isles series, so I was thrilled to read another book by her. Miranda Wood is just like any other person who falls in love, although not all romance stories end with a happy ending. Arriving home, Miranda walks into her worst nightmare, the married man who she had been having an affair with is now dead in her bed. Not only that but she is now the prime suspect in his murder. When she gets bail, Miranda is thrown in a dangerous world, not knowing who to trust and who would kill Richard plays on her mind, day and night. To her everyone could have a motive from killing him but what she must find out is which one wanted it more and why they are now after her as well. Being a big Rizzoli & Isles fan I didn't know what to expect from a stand-alone thriller but I am so glad I read it. It would have to be one of my favourite thriller books, with the suspense, crime, romance and scariness I couldn't put it down! I would have to say my favourite part of the book would be the on-going mystey element. I drew me in completely making me enthralled with the story and characters. Presumed Guilty is a mind-blowing thriller that will have you on the edge of your seat until the last page. 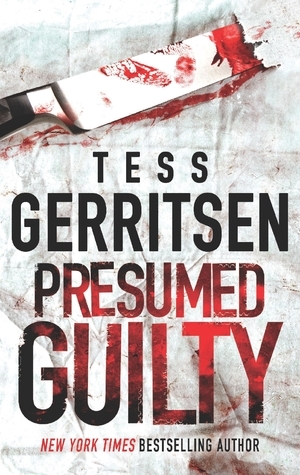 I would recommend every Tess Gerritsen fan to read this amazing book as you will be guilty of loving it as much as I do! Three Words Thrilling, Unexpected and Phenomenal.